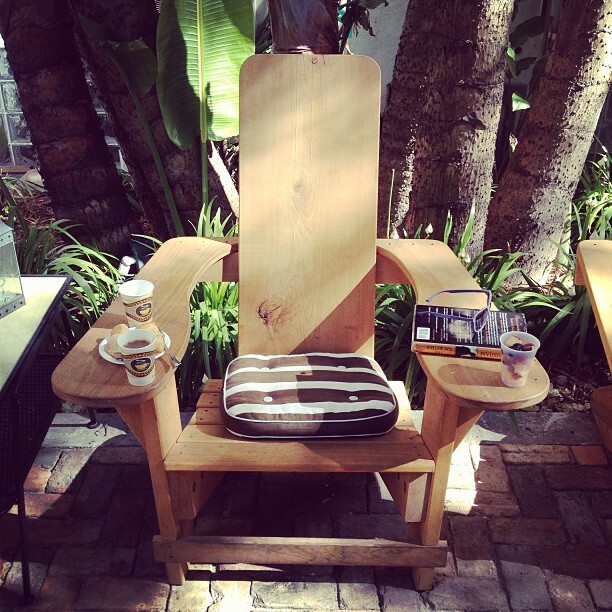 The Adirondack chair is named after the northeastern New York State Adirondack Mountains. This area is 6.1 million acres of preserved rugged mountain forest park land that receives hundreds of thousands of visitors each year. However, the name is all that connects the Adirondack chair to this mountain region, according to the Adirondack Museum in New York state, because they say the exact birth place of the Adirondack chair is still a mystery. "The immaculate conception" is how Craig Gilborn former director of the Adirondack museum describes the chair's inception. "It just adds to their allure," he says. 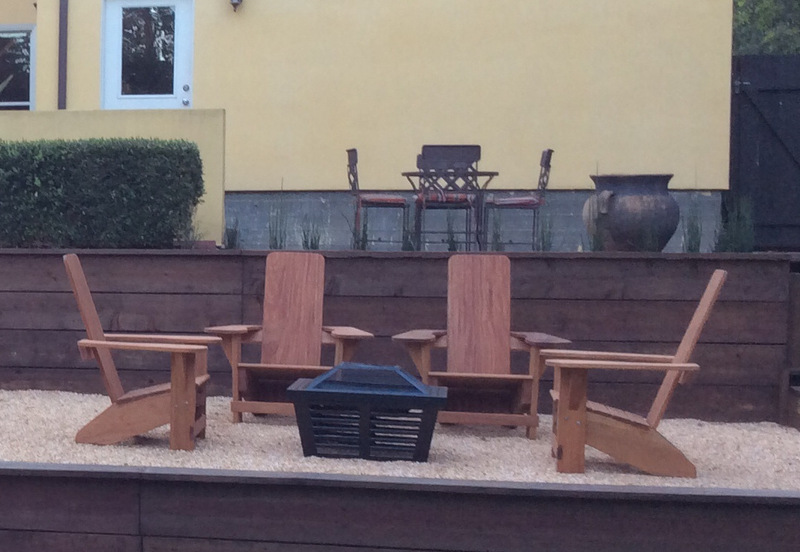 Still many feel the Adirondack chair may have evolved from the older Westport chair which somewhat resembles the more common Adirondack chair, but has certifiable Adirondack roots. 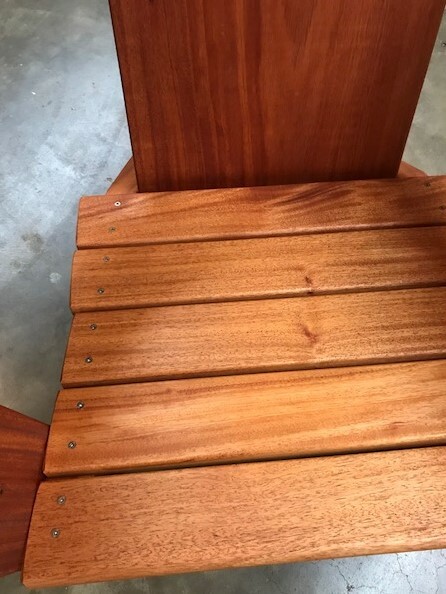 The main difference between the two chairs is the Westport chair is constructed with large wide boards while the more traditional Adirondack chair is constructed with smaller board slats. 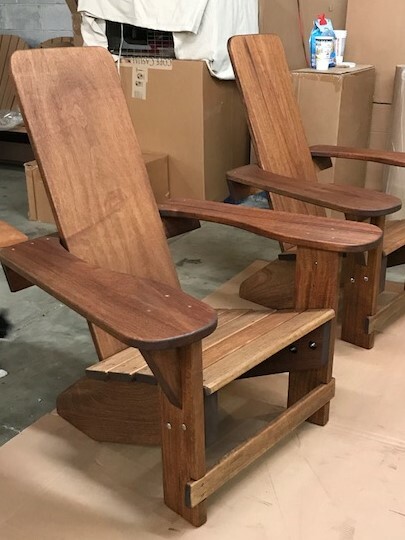 When you consider the two features that are considered hallmarks of a true Adirondack chair; the raked slanted back and the large broad armrests and the fact that the Westport chair has a slanted back and wide broad armrests then it is easy to see why the older Westport chair could very well have been the original Adirondack chair. One thing is for sure, regardless of the uncertain Adirondack chair history it has become an American icon that is seen across the entire United States. The documented Westport chair story begins in the year 1903. A man named Thomas Lee, while on vacation with family and friends at his summer cottage in Westport, N.Y., a small village about 10 miles east of the Adirondack mountains on the shores of Lake Champlain, began to work out a design for some outdoor chairs for them to use. The chair Mr. Lee designed and built had a slanted seat and back design, something that had already been in use for the uneven Adirondack mountain ground. The slanted chairs allowed people to sit in an upright position when placed on a steep hill. This made it possible to sit comfortably looking down the mountains because no one wanted to sit looking up the mountains. Undoubtedly, there were many variations of hill sitting chairs around the area, but the one Lee designed is the chair in the record books. Mr. Lee had no idea that his chair family members called "Uncle Tom's chair" would be anything more than some comfortable chairs for his summer home. The pictured chair to the top left is our version of Mr. Lee's original chair design that we build. The Westport chair may have never been documented if Thomas Lee had not offered his chair design to his hunting friend Harry Bunnell. The reason he did this was to help Harry make some money. Turns out Harry was broke and feared he would not make it through the winter. Trying to be helpful Lee suggested he take his chair design and build it at his home carpentry shop to sell to the locals. But as it turned out, Mr. Bunnell had more in mind and saw the chair Lee designed as a way he could make a future living. After doing some planning, Bunnell took the chair design and filed for a patent on April 4, 1904. Later, on July 18, 1905, Bunnell received his patent for the chair he called the "Westport Chair". Sadly, he never told his helpful friend Thomas Lee anything about applying for a patent nor did Mr. Lee try to do anything later after he learned he received one. Nevertheless, Bunnell became successful manufacturing and selling the chair for the next twenty five years. He built all his Westport chairs with Hemlock or Basswood, stamped them on the backrest with his U.S. patent number, painted them a dark red brown or left them unpainted and introduced several different variations (improvements you could say) over the years. His choice of Hemlock wood might seem odd because it is not a naturally durable wood nor is it considered a very suitable wood for furniture, but it was and is still readily available in the New England States area. The chair never became wide spread as it never reached distribution further than a 100 square mile radius of Westport, New York. Even today, it still does not have the wide acceptance of the Adirondack chair, yet an original antique "Westport chair" that meets certain conditions can be valued at more than one thousand dollars. Today, Adirondack chairs have changed and can have any number of differences, such as seats and backs with any number of slats, contoured seats and backs, straight seats and backs, fancy curves here and there, built out of just about any wood you can think of, different size and number of legs and some differences I probably do not even know. 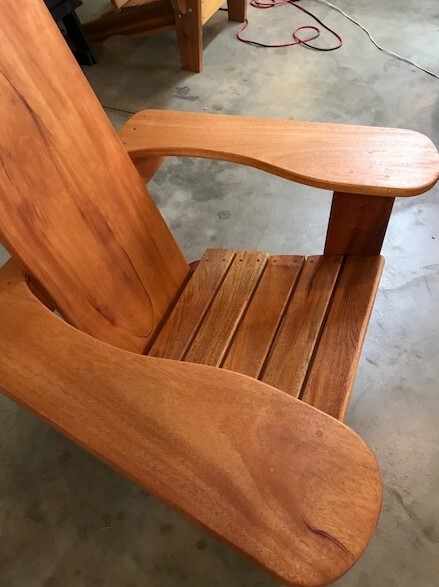 However, there are still two main distinguishing characteristics of the "Westport" chair Mr. Bunnell made over 100 years ago that are considered hallmarks of a true Adirondack chair. They are the raked slanted back and the large broad armrests. 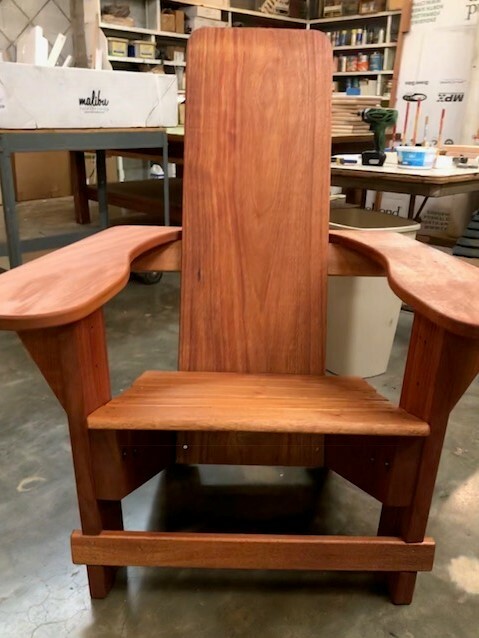 Keeping with tradition, we build our Clarks Original Westport Adirondack chair like Harry Bunnell did over 100 years ago. We even like to think it is better because we have better wood working equipment. So the story goes on and undoubtedly the chair will continue to change over the years, but for many it remains the truly all American chair that has come to symbolize easy summertime living. 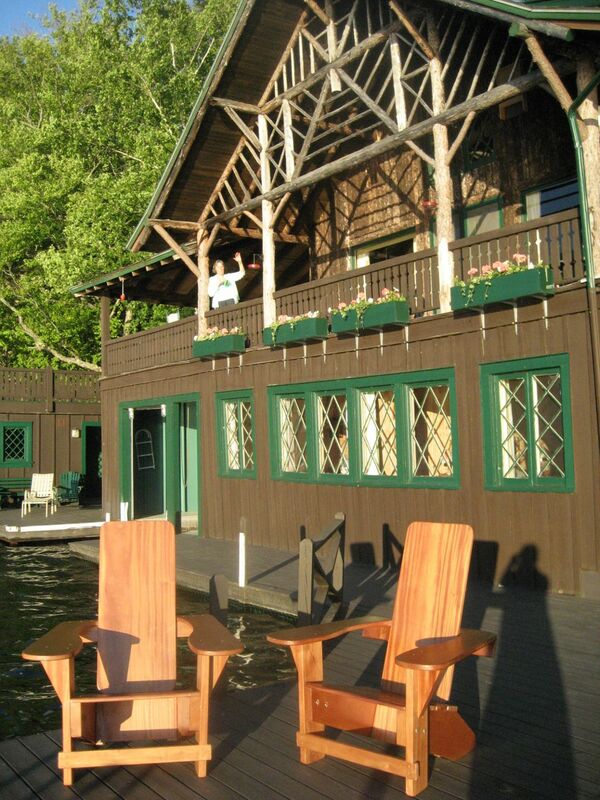 Documented Adirondack chair history has the first Westport Adirondack chair being built in the state of New York in 1903. The chair was named the "Westport Plank chair" and was made and sold for over twenty years. Our Clarks Original Westport chairs have the same hallmark features of the iconic 1903 chair. A tall one piece back, wide arms and the same overall design appearance. This chair is surprisingly comfortable as well as a very unique piece of American history. Our version of the historic Westport chair is built with Mahogany wood. It is durable as well as strong hardwood. The 1903 chair was made with Hemlock. For extra sturdiness and durabliity our back legs are made with large two inch thick boards and the front legs are made with one and a half inch thick boards. The 1903 chair had one inch thick legs. 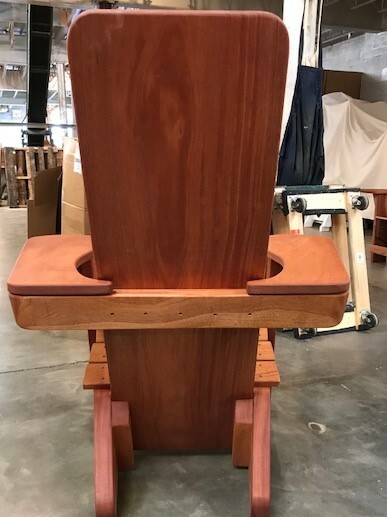 For better water drainage and comfort we designed the seat with five one inch thick slat boards rather than using only two like the 1903 chair. Like the 1903 chair we use wide 9 1/4" by one inch thick arms. For strength we run 2 1/2" inch screws going down into the front legs and wood plugs to hide the screws rather than going under the arm and up which hides the screws, but has less holding strength over time. Our chair like the 1903 chair has a beautiful solid one piece back. The overall appearance of both chairs is the same. of the wide back boards. Seat depth 20 1/2" Seat width 23 1/2"
Back height 44 1/2" Arm width 9 1/4"
Chair weights 75 to 80 lbs.